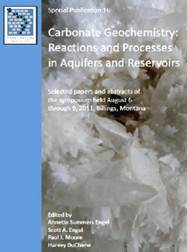 This electronic publication is Special Publication 16 from the Karst Waters Institute, consisting of selected papers and abstracts for the Carbonate Geochemistry: Reactions and Processes in Aquifers and Reservoirs symposium held August 6-9, 2011, in Billings, Montana. Conference Proceedings (2011). ISBN Number 978-0-9789976-5-6. Soft-bound, 84 pages. Recommended Citation: Engel, A.S., Engel, S., Moore, P., and DuChene, H., Eds., 2011, Carbonate Geochemistry: Reactions and Processes in Aquifers and Reservoirs. Selected papers and abstracts of the symposium held August 6 through 9, 2011, Billings, Montana. Karst Waters Institute Special Publication 16, Karst Waters Institute, Leesburg, Virginia, 84 p.